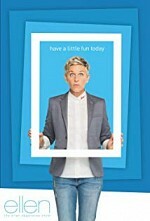 Watch Ellen: The Ellen DeGeneres Show: A mix of celebrity interviews, musical performers, audience participation games, and segments spotlighting real people with extraordinary stories and talents. Episode 113 - Donald Trump/Harry Connick Jr. Episode 123 - Kirsten Dunst/Steven Weber/Shelby Lynne. Episode 126 - Heath Ledger/Camryn Manheim/N.E.R.D. Episode 56 - Usher, Cyndi Lauper, Rosie Perez, the cast of "Rent"
Episode 75 - The cast of "The Producers"
Episode 39 - Amanda Peet, veggie card cutter Rick Smith Jr. Episode 85 - The cast of "Little Miss Sunshine"
Episode 108 - Forest Whitaker, Billy Blanks Jr. Episode 154 - Am I Right Ladies? Episode 85 - George Clooney/Kiefer Sutherland/T.I. Episode 91 - Joey Fatone, O.A.R. Episode 61 - Tobey Maguire, Cirque du Soleil's "Kooza"
Episode 2 - Lauren Graham, the cast of "Jersey Shore"
Episode 6 - Harry Connick Jr. Episode 6 - Bethenny Frankel, Kellie Pickler, the top four from "So You Think You Can Dance"
Episode 58 - Jessica Biel, Damon Wayans Jr. Episode 153 - Harry Connick Jr. Episode 45 - Matthew McConaughey, Damon Wayans Jr. Episode 91 - Usher, Octavia Spencer, the top six finalists from "So You Think You Can Dance"
Episode 145 - Ellen Flies 300 of Her Biggest New York Fans to Los Angeles for a Trip of a Lifetime!